I just finished my first pocket holster. Many of my students have smaller pistols and are looking for a way to conceal them easily. This may be the answer for some…. Pocket holsters are sometimes called Wallet Holsters. They are typically designed with a panel attached to the back to make them look like a wallet in your back pocket. With the pocket holster the panel is hinged at the bottom by removable Chicago Screws. This allows you to easily reach between the panel and holstered firearm, for draw and presentation of the firearm. You can safely keep your finger indexed along the side of the gun and not on the trigger until you need it. The panel covers the firearm and holster, and it all appears to look like a wallet in your pocket. Excellent concealment for smaller pocket pistols. 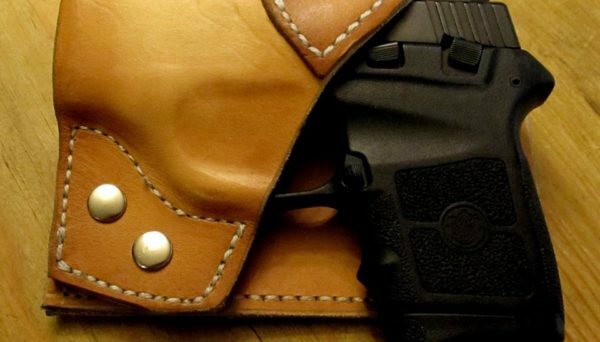 Pocket holsters can be used in a front pocket as well with larger front pockets like cargo pants/shorts or tactical pants, also the screws can be removed to use the holster as a Front Pocket holster without the back panel. Let me know and I would be glad to make you one.